 Register an Irish Domain Name with Hosting Ireland for €70 per year - a 44% discount.  Register an Irish Domain Name or transfer your existing domain name now. 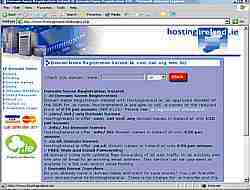  Choose Hostingireland €30 instant hosting offer - Pay on-line for immediate service. Click through to Hosting Ireland for low cost domain name registration.